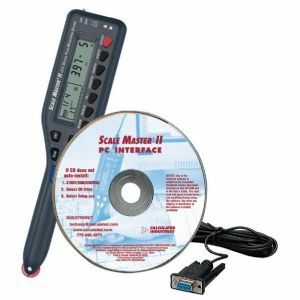 SCALEMASTER II with COMPUTER INTERFACE KIT: For construction pros and estimators looking for the fastest, most accurate and versatile way to do “take offs” from prints and plans. The Scale Master® II features 91 built-in scales to cover virtually any application. Includes eight custom scales that can be set by the user to accommodate prints and plans that have been faxed, enlarged, reduced, or are unscaled. Instantly calculates regular shaped areas and volumes. Features accumulating memory, subtract key, push-button counter, and auto-count mode. Can be used as a standalone device or may be connected to any PC running Windows® 98 or later, for input of measurements and values directly into estimating or spreadsheet programs. Includes complete installation and operation manual, long-life batteries, protective hard case, and a full one-year warranty. PC Interface also includes software and 10 foot, 9-pin cable connector with USB port adaptor.